POWELL, Ohio (May 23, 2012) – CME Outfitters (CMEO), a leading accredited provider in continuing medical education, has been selected as a winner of the 2012 American Inhouse Design Awards, sponsored by The Creative Group. CME Outfitters design team was recognized for their outstanding design work for the 4th Annual Chair Summit Brochure. This is the second time CMEO received this award since 2009 when they were recognized for their creative design for the 1st Annual Chairs in Psychiatry Summit brochure. CMEO also received 2 American Graphic Design Awards in 2007. “We are very proud to have received this prestigious award again this year. To be honored as one of the top 10% of more than 4,000 entries serves as a true testament to our hard work and commitment to clean and effective design here at CME Outfitters,” said Nakina Webster, Senior Graphic Designer, CME Outfitters. The competition presented by Graphic Design USA (GDUSA) has emerged as the premier showcase for outstanding work by inhouse designers. It is a unique opportunity for inhouse design, marketing, and communications departments within corporations, publishing houses, non-profits, universities, and government agencies to be recognized for their creativity, for the special challenges they face, and for their contributions to their businesses and institutions. CMEO's winning print design entry, http://www.neurosciencecme.com/images/MM031-BrochureCover.jpg is a direct mail brochure for the 4th Annual Chair Summit – Master Class for Neuroscience Professional Development, a three and a half day event that showcased over two dozen faculty chairs from the nation's most renowned academic institutions. 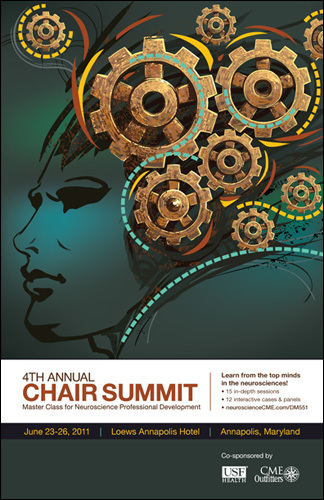 The 5th Annual Chair Summit is scheduled for October 11-13, 2012. Details can be found at http://www.neurosciencecme.com/chair2012/. CME Outfitters develops and distributes live, recorded, and web-based, outcomes- and evidence-based educational activities to thousands of clinicians each year and offers expert accreditation and outcome services for non-accredited organizations. CME Outfitters focuses on delivering education to specialty audiences with strong expertise in neuroscience, autoimmune diseases and cardiovascular disease. For a complete list of certified activities and more information, visit www.cmeoutfitters.com or call 877.CME.PROS (877.263.7767). neuroscienceCME.com is an award-winning web portal serving clinicians, educators, and researchers in the neurosciences. Launched in October 2006, neuroscienceCME.com fills an identified gap in online resources for professionals around the world who practice in areas related to psychiatry, sleep disorders, pain, and neurology. The site's primary mission is to be a central forum for accessing, debating, synthesizing, and implementing the latest findings and best practices in the neurosciences. Visit www.neuroscienceCME.com to learn more.